The Tomb Exhumer Mouse is a breed of Event mouse that can be found in the Burroughs Rift when hunting with Undead String Emmental cheese. Cheese: Undead String Emmental Charm: ?? The Tomb Exhumer Mouse has been found to be especially attracted to Undead String Emmental cheese, to the point that any other kind of cheese will simply not suffice. Law and Rift traps are effective against the Tomb Exhumer Mouse. All other power types (except Parental) are less effective. 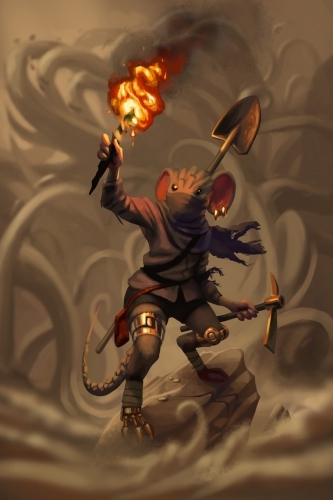 The Tomb Exhumer Mouse is available throughout the year in the Burroughs Rift locations, but only if a Hunter arms Undead String Emmental cheese. 17 May 2017: The Tomb Exhumer Mouse was introduced as part of the Zombie Invasion 2017 event. Tomb Exhumer mice are the Rift version of Grave Robber mice. This page was last edited on 19 December 2017, at 08:03.